Arrival in Lima, assistance and transfer to the hotel. Transfer to the station to take the bus to Paracas. At your arrival assistance and transfer to the hotel.In the afternoon transfer to Pisco airport and discover the mystery of the Nazca Lines and appreciate them by air in a small aircraft. In this amazing tour you can see and these giant figures that the ancient inhabitants of Peru left marked on the vast Pampa de Nazca. Proof of the genius and wisdom our ancestors had. Dr. Maria Reiche, German archeologist who dedicated her life to studying the lines described it as the largest astronomical calendar in the world. We will fly over these mysterious drawings made in the sand that represent several animal shapes such as a spider, a monkey, a dog, a humming bird, a condor, amongst others; all of these having huge dimensions that vary from 50ft to 985 ft. in length and one foot depth. Return to the hotel. In the morning admire the sea and the ecological richness of Peru. Early morning departure to the pier to board comfortable sailboats and sail the Ballestas Islands. 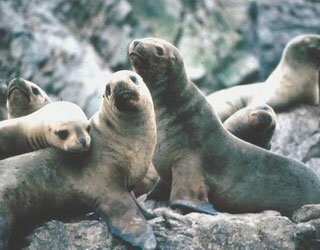 In this area there is an important marine fauna and here you will find large colonies of sea birds such as: the guanay, the booby, the tendril plus some examples of Peruvian penguins (Humboldt), a lot of seals (fur seals and sea lion) besides other species. 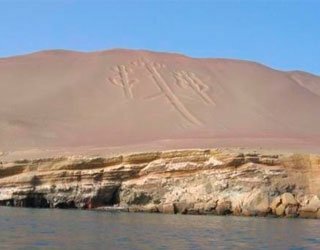 Prepare your camera to take amazing pictures of the biodiversity in this area and also the famous “Candelabro de Paracas” (part of the Nazca Lines).At according time return to the station to take the bus back to Lima. At your arrival assistace and transfer to the hotel.In the afternoon be captivated by the beautiful “White City of Arequipa” name given because of the volcanic ashlars stones used in its structure. Admire the Main Square, the Cathedral, make a stop at the viewing platforms of Carmen Alto and Yanahuara to get a great photo of the city, finally visit Saint Catalina Convent built in the 16th century with its 215,000 sq. ft. of prison cells, convents, volcanic stone fountains surrounded by gardens and narrow alleys. 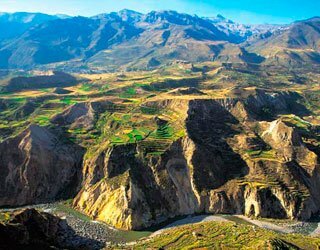 Admire and appreciate the wonderful mountain scenery near the majestic flight of the condor in the Colca Canyon, considered the deepest canyon in the world. Early in the morning you will leave Arequipa via Yura along the skirts Chachani mountain, Pampa de Arrieros, Pampa Cañahuas National Reserve where you may admire the vicuñas. We will continue to Vizcachani and Pampas de Toccra, home to a large variety of birds.Once in Chivay recover your energy with a delicious lunch and then enjoy the afternoon on your own. As a suggested activity we recommend a visit to “La Calera”,( hot water Springs) known for its natural medicinal purpose. (this activity is not included, please ask for rates). Appreciate a beautiful Andean sunrise along the Colca Canyon towards the path that leads to the “Cross of the Condor”, a place offering the most spectacular landscapes of the entire canyon, here you can see the elegant flight of these huge birds whose wings extend up to 03 meters; admire its majestic flight and get an excellent view of the Colca Canyon, a unique opportunity to take great pictures. You will return to Chivay for lunch (not included) and finally take the bus to Puno. At your arrival assistance and transfer to the hotel.Accommodation in Puno. Sail the waters of Lake Titicaca. Early in the morning you will start an excursion to the highest lake in the world. The tour includes a visit to Uros Island where you can go by comfortable motor boats. 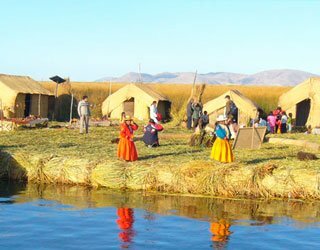 Uros is part of Aymara ethnic family of islands that live on artificial islands made of floating reeds (Totora is a plant that exist in the region). From here you can reach the hillls of Taquile Island. Gifted with several hills and harboring archaeological sites, the island’s main activity is textiles (hand works of art) representing scenes of everyday life. You will have lunch at a nearby local place.Accommodation in Puno. 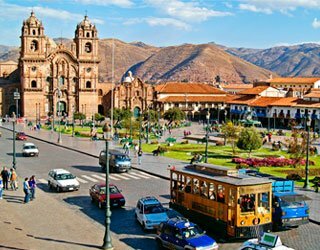 Embark on a comfortable tour bus and go through beautiful Andean landscapes up to the city of Cusco.On the way there you will see several touristic attractions such as Pukara, the last stop in route to Cuzco. In Pukara you can take a guided tour of the Museum that holds the remains of many archeological figures of Andean times. We will also pass through La Raya, the highest point in the entire tour (14,223 ft.). Here you can enjoy few minutes to admire the landscape and take some amazing photos before continuing. The bus will stop for lunch at Sicuani village, where you will then continue the tour to the archeological center of Raqchi, an enormous building made in honor of Wiracocha God, finally you´ll arrive at Saint Peter Church of Andahuaylillas, also known as the Sistine Chapel of America. Arrival to Cusco. Morning at leisure.In the afternoon admire the wonderful pre-Hispanic and colonial legacy of Cusco, an interesting journey where you will learn about the Temple of the Sun “Koricancha”, ancient place of worship to the Sun God of the Incas where the convent of Santo Domingo was located, admire the beauty of the Main Square of Cusco and observe the most known sculptures and paintings in Cuzcanian Art inside the cathedral. Continuing the city suburbs we will visit the Inca complexes of Kenko, Tambomachay, Puca Pucara and the impressive Sacsayhuaman Fortress, strategically built on a hill overlooking Cusco, famous for it’s huge stones of its external walls, cut and assembled with stunning precision. Live one of the most fascinating and extraordinary experiences of the world: Machu Picchu. The adventure begins by embarking on one of the most beautiful railway routes, pass through picturesque Andean landscapes and enjoy the amazing lush jungle until you arrive to the City of Aguas Calientes; here you´ll take the bus for a 30 minute drive along a zigzaging path leading to the marvelous citadel. Machu Picchu may have been home to Pachacutec, first Inca emperor.Walk through passageways and alleys of the citadel enjoy and take in this unique place in the world. Take free time to enjoy the mystic energy and natural beauty of the site before returning to Aguas Calientes for lunch. In the afternoon you´ll take your train back to Cusco. At according time transfer to the airport to board your flight back to Lima.